Michelangelo is widely considered one of the greatest artists of the Italian Renaissance period all time. Everyone knows the name Michelangelo. Heck, they even named a Teenage Mutant Ninja Turtle after him (that’s how you know you’ve made it). His most famous works – the Sistine Chapel, Pieta, and the sculpture of David – have been carefully preserved over the years, ensuring future generations will be able to admire their beauty and appreciate Michelangelo’s genius. Have you always dreamed of visiting Italy and seeing these masterpieces firsthand? Sounds like you need to book an Exciting Italian Vacation with AESU, the most trusted name in travel. We offer several trips to Italy: Cosmopolitan, Explorer, Euro Focus, Great Escape, Euro Spree, and, of course, Viva Italia. Michelangelo’s most famous works have to be his Pieta, his sculpture of David, and his painting of the Sistine Chapel ceiling, both of which reside in Italy. In 1498, Michelangelo was commissioned by the French cardinal Jean Bilhères de Lagraulas to sculpt a Pietà – a statue depicting a draped Virgin Mary with her dead son resting in her arms. Carved from a single block of marble, Michelangelo’s work stands 69 inches tall, featuring two intricate figures. It is the only piece Michelangelo ever signed. To this day, the Pietà attracts legions of visitors to St. Peter’s Basilica. In 1501, Michelangelo was commissioned to create a huge male figure for the cathedral of Santa Maria del Fiore. He chose to depict the young David from the Old Testament. When it was finished, the statue was placed in a public square, outside the Palazzo della Signoria, the seat of civic government in Florence, and not in the cathedral of Santa Maria del Fiore. Today, the 17-foot tall sculpture resides in the Galleria dell’Accademia in Florence. In 1508, Pope Julius II commissioned Michelangelo to depict the 12 apostles on the ceiling of the Sistine Chapel in Vatican City. However, Michelangelo demanded creative freedom. Instead of the 12 apostles, Michelangelo painted nine scenes from the first book of the Bible, Genesis, surrounded by seven prophets and five sibyls (female prophets of myth). 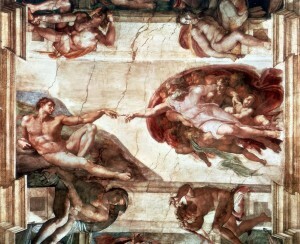 The most famous of these paintings is The Creation of Adam, which depicts God and Adam outstretching their hands to one another. The Sistine Chapel ceiling took Michelangelo four years to complete, 1508-1512. If you are interested in the works of Michelangelo, our Viva Italia trip is for you! You begin your journey in Venice, travel along Italy’s boot to Michelangelo’s Florence , and Caesar’s Rome. Want help booking an Exciting Italian Vacation? Please contact AESU by calling 800-638-7640 or fill out the contact form found on our website. And don’t forget to check out all of our great Travel Tips, especially the Travel Tips for Europe, before you head overseas. This entry was posted on Thursday, November 20th, 2014	at 6:04 pm	. You can follow any responses to this entry through the RSS 2.0	feed. Both comments and pings are currently closed.